Fright Night (2011) – WHO IS THE MAN FROM KRYPTON? Fright Night tells the story of Charley Brewster, played by Anton Yelchin, finding out that there is a vampire, played by Colin Farrell, living next door to him and once said vampire threatens his family and girlfriend, played by Imogen Poots, he takes it upon himself to kill the vampire. He enlists help from a Las Vegas performer, played by David Tennant, and supposed vampire slayer. I love Anton Yelchin in every film i have seen him in and this doesn’t change with Fright Night, he plays a teenager who used to be a nerd with nerdy interests to one of the more popular people at his school and in the process he has managed to get a very attractive girlfriend. Yelchin plays the role very well, you sometimes see a confident guy with a slight air of arrogance to him, yet others his nerdy side is fully overt. 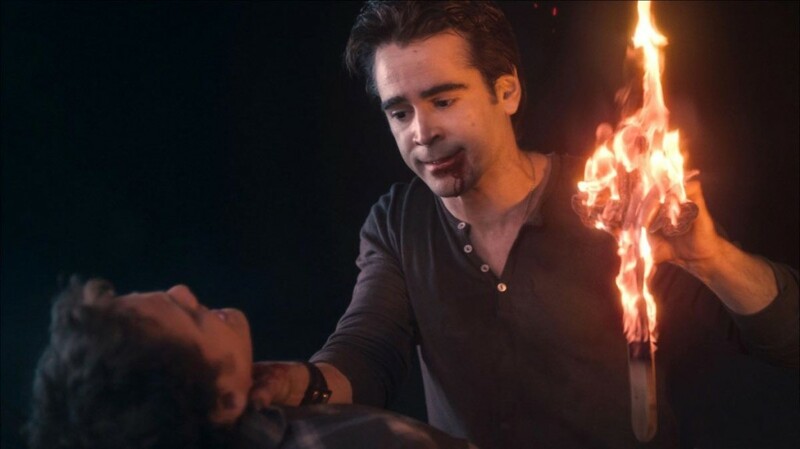 Colin Farrell was brilliant as vampire Jerry, you can tell he had a lot of fun with the role. Making a vampire dark and scary again was no easy feat considering the mockery Twilight has made of vampires. (There is a few digs at Twilight in the film which i appreciated). It’s good to see Farrell back in the movies. David Tennant plays Peter Vincent, the supposed vampire slayer and although i will admit i am not a fan of Tennant, he really impressed me here as the drunk, clueless comic relief character, however when that changes he also brings the action to the table and is extremely well portrayed. Fright Night is directed by Craig Gillespie. I will admit that i have not seen his previous 2 films (Mr Woodcock & Lars and the Real Girl), but here he does a solid job. Inventive camera angles, interesting cinematography, etc. Nothing too outstanding but better than some effort director’s put into horror movies. Fright Night is fun, gorey but not too much, has a great, well performed cast and most importantly shows that vampires don’t have to be abstinent. One of the better horror movies of the year, definitely check it out if you are into horror movies.